The hunt for Annie Barrett was on, and she immediately turned up on the 1900 census in Camden, New Jersey. I knew I had the right woman when I saw her parents were both born in England. There were several hours of crazed digging as I worked through the records and found the 1910 census and the 1895 New Jersey State Census. After marrying Thomas, she appears on records as both Phoebe and as Ann/Anna/Annie. I also found New Jersey birth and marriage registrations for several of her children, as well as a Social Security Application for one to prove Annie Barrett’s maiden name was Walker. Phoebe Ann Lincoln Walker married Thomas Patrick Barrett about 1884. Thomas was born about 1863 in Ireland, the son of Thomas Barrett (1843-1875) and Johanna Griffin (1843-?). His immigration dates appear as 1865/66 and he lists himself as naturalized. Thomas appears with his family on the 1870 census as Patrick. There are multiple Thomas and Patrick Barretts in Philadelphia and New Jersey which has lead to some confusion. However, our Thomas Patrick Barrett is a machinist in Camden from at least 1895-1940. His job and location do not vary, and throughout his adult life, one or more of his children is in the same household. 1884 – Phoebe Ann and Thomas Patrick marry. I believe in a church in Philadelphia, but I have not yet found a record of the marriage. This is based on their census information. 1887	Mar – daughter Annie Barrett born in Philadelphia. 1910-12 Phoebe Ann Lincoln (Walker) Barrett passed away. She appeared on the 1910 census completed 28 April and in the Camden city directory, but not in the 1911 directory. She’s definitely deceased prior to the 1915 New Jersey State Census when Thomas lists himself as a widower. 1916-17 – daughter Cecelia marries Lloyd Fulcher. 1920 – Not yet found on the census, however Thomas, Thomas Jr. are in the Camden City Directory.17 They along with Helen, and Mary are in the Camden City Directory from 1921-25 at 210 Main St.
After 1940 – Thomas Patrick Barrett passed away. The documentation is available on the BurgraffScott family tree on Ancestry and being added to FamilySearch.org. 1. Philadelphia, Philadelphia, Pennsylvania, FHL Film #1,289,324, Charles L. Barrett, 23 May 1885, Father Thomas Bareet, Mother Annie Barrtt; digital image, “Pennsylvania Births and Christening, 1709-1950,” (11 Aug 2017). 2. Pennsylvania City of Philadelphia, Philadelphia City Death Certificates 1803-1915, FHL Film #2,078,756: Annie Barrett, 1 Jul 1887, age 3 mo, Father Thomas P. Barrett, mother Annie Barrett; digital image, Family Search, New Family Search (http://pilot.familysearch.org: 11 Aug 2017). 3. Philadelphia, Philadelphia, Pennsylvania, Bk Jan 1888, p. 296, Mary Barrett, 30 Jun 1888, Father Thos. Barrett, other Annie Barrett; digital image, “Pennsylvania, Philadelphia, City Births 1860-1906,” (11 Aug 2017). 4. Social Security Administration, “Social Security Death Index,” database, Ancestry (http://www.ancestry.com : accessed 11 Aug 2017), Catherine Mason, b. 12 Feb 1891, d. Aug 1978. 5. Social Security Administration, “Social Security Death Index,” database, Ancestry (http://www.ancestry.com : accessed 11 Aug 2017), Josephine Shaner, b 28 Jul 1893, d. Jan 1964. 6. New Jersey, population schedule, Camden, p. 144, family 882, line 4305, Annie Barrett, 20-60; digital images, Ancestry(accessed 12 Aug 2017). 7. “New Jersey, Births and Christenings Index, 1660-1931,” database(accessed 12 Aug 2017), Female Barrett, b. 2 Oct 1897, father Thomas Barrett, mother Phoebe Walker; FHL Film #494237. 8. “New Jersey, Births and Christenings Index, 1660-1931,” database(accessed 12 Aug 2017), Male Barrett, 20 Feb 1900, father Thomas Barrett, mother Phoebe Walker; FHL Film #494237. 9. 1900 U.S. census, Camden, New Jersey, population schedule, Camden, enumeration district (ED) 33, p. 4A, dwelling 79, family 80, Annie Barrett; digital images, Ancestry (accessed 12 Aug 2017); citing National Archives and Records Administration microfilm T623, roll 957. 10. Pennsylvania, Wills and Probate Records, 1683-1993, Kate Walker, 7 Feb 1901, Philadelphia, Case #230, Wills, No 218-245, 1901; digital images, Ancestry (accessed 11 Aug 2017). 11. Social Security Administration, “Social Security Death Index,” database, Ancestry (http://www.ancestry.com : accessed 12 Aug 2017), Helen Gribbin, b. 26 Jul 1902, d. 5 May 1989. 12. 1905 State Census, New Jersey, population schedule, Camden, p. 35, line 43, Annie P. Barrett, 38; digital images, FamilySearch.org(accessed 12 Aug 2017); citing FHL microfilm 1,688,591. 13. New Jersey, Marriage Index, 1901-1914, “Ancestry,” database (accessed 12 Aug 2017), Mary Barrett to Albert Richter 1908. 14. “Philadelphia Marriage Indexes, 1885-1951,” database, Fmaily Search (http://www.familysearch.org : accessed 12 Aug 2017), Charles Barrett to Mary Frees, 1908. 15. 1910 U.S. census, Camden, New Jersey, population schedule, Camden, enumeration district (ED) 8, p. 14B, dwelling 270, family 278, Phoebe A. Barrett, 41; digital images, Ancestry (accessed 12 Aug 2017); citing National Archives and Records Administration microfilm T624, roll 872. 16. 1915 New Jersey State Census, New Jersey, population schedule, Camden, Camden, p. 16A, family 346, line 30, Thomas P. Barrett; digital images, FamilySearch(accessed 12 Aug 2017); citing FHL Film #1,465,509. 17. Camden, New Jersey, City Directory, 1920 p.89, Barrett, Thos, machst, h 63 State St; digital imagesaccessed 12 Aug 2017. 18. New Jersey, United Methodist Church Records, 1800-1970, “Trinity, Camden, 19 Aug 1924 William Shaner to Josephine Barrett,”; digital images, Ancestry. 19. “Philadelphia Marriage Indexes, 1885-1951,” database, Fmaily Search (http://www.familysearch.org : accessed 12 Aug 2017), Thomas Barrett to Catherine Guilfoy, 1926. 20. 1930 U.S. census, Camden, New Jersey, population schedule, Camden, enumeration district (ED) 2, p. 7A, dwelling 89, family 93, Thomas P. Barett, 65; digital images, Ancestry (accessed 12 Aug 2017); citing National Archives and Records Administration microfilm T626, roll 1319. 21. 1940 U.S. census, Camden, New Jersey, population schedule, Camden, enumeration district (ED) 8-3, p. 2A, Thomas P. Barret, 75; digital images, Ancestry (accessed 12 Aug 2017); citing National Archives and Records Administration microfilm T627, roll 2342. Jeremiah Walker (1833-1885) was an interesting man to chase. I first found him with his family in England, and then later, in the Church of the Redemption, Spring Church, in Philadelphia. This is one of those families that was exciting to chase because there were records. It was also incredibly sad to chase this family as so many of the children died young. Perhaps the best part of chasing this family was tag-teaming with my cousin Jamie. When I’ve done all I can and become frustrated, Jamie will step in and take over. She always seems to find the missing link to take us in the right direction. We were at a dead stop on the two oldest surviving children in this family when she found the right connection. Once I had the right names, I went digging through a different set of records and found the proof that linked his younger two daughters to Jeremiah. Jamie and I work well together and it’s always a lot of fun. On 13 Aug 1848, at the age of 15, Jeremiah arrived in Philadelphia aboard the Wyoming.3 It appears that he made this trip alone. 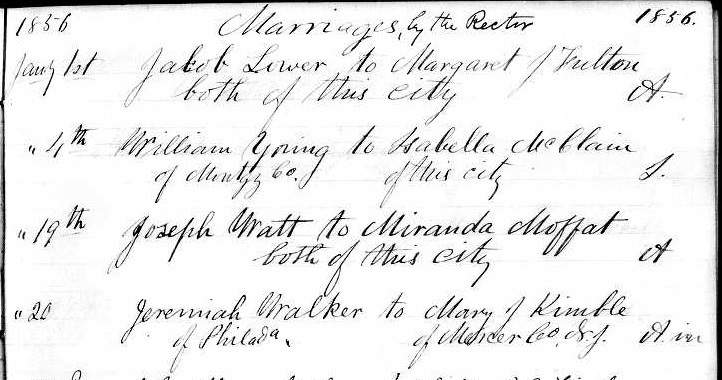 Jeremiah was married to Mary Jane Kimble on 28 Jan 1856 in Philadelphia at the Church of the Redemption, Spring Church.5 The record states she was “of Mercer County, NJ” but does not provide us with the couple’s ages or any other helpful information. **NOTE** There is a 7 Sep 1852 marriage record from St. Stephen’s Episcopal Church in Philadelphia for a Jerry Walker to Mrs. Mary J. Bailie which led to some early confusion. Our Jeremiah would have been about 19 and Mary Jane Kimble would have only been about 15/16. 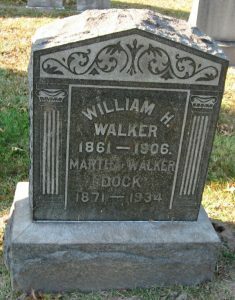 There is a Jerry Walker (1816-1886) buried in Laurel Hill Cemetery along with Mary Jane Walker died (1817-1873) who would be of the right ages for this record. They are both listed as being born in Philadelphia and found on the 1870 census in Ward 7 while our Jeremiah is in Trenton, New Jersey. Jeremiah appears to have stayed in Philadelphia from at least 1856 through mid-1861. His first three children were born and baptized there. 1861 would have been a difficult year for the family as Scarlet Fever claimed their oldest daughter just weeks after the birth of their third child. Perhaps this was the impetus to move from Philadelphia. By late 1863, he and his family have relocated to Chambersburg, Mercer, New Jersey. His fourth child John Rogers Walker was born there 16 Nov 1863. [Chambersburg was a separate municipality at that time; it has since been incorporated by Trenton and most records are listed with Trenton as the location.] Jeremiah and Mary Jane had the rest of their children there and remained there for the rest of their lives. He served during the Civil War in the 4th Regiment, New Jersey Infantry, Co B. He applied for an invalid pension, application #183218, and was approved, certificate #133577. There was an application filed for his minor children, application #351584 after his death. Those records should be available through the National Archives. I haven’t yet located Jeremiah or his surviving children on the 1880 census or 1885 New Jersey State Census. Jeremiah died 6 Sep 1885 in Chambersburg, Mercer, New Jersey.10 He was interred in Mercer Cemetery. Margaret Ann – born 3 Jul 1859 in Philadelphia and baptized 9 Jul 1860 at the Church of the Redemption, Spring Church, Philadelphia, along with her older sister Mary Alice.13 Margaret shows her birth date and Jan 1858 on the 1900 census, but her baptismal record provided her birth date. Also, her older sister was born in Nov 1857 so the Jan 1858 date would have been impossible. Margaret married Joseph C. I. Stone on 9 Feb 1879. This date appears in several family trees, however I have not yet found a source record of the marriage. Her sisters remained with her even after their marriages. Since we didn’t find the family on the 1880 Federal Census or the 1885 New Jersey Census we were unaware of the names of the two younger girls until the 1900 Federal Census. The guardian records are filed under the children’s names. Their known children: William (Sep 1892-13 Jun 1893) and Howard (Mar 1896-27 May 1909). Jeremiah Walker – Born 27 Jul 1866,25 died 29 Oct 1882 (age 16) of typhoid fever, buried 31 Oct 1882 in Mercer Cemetery.26 His obituary was published on 31 Oct on page 2 in the Trenton Star Gazette. Joshua O. Walker – Born 9 Sep 1869,27 died 17 Nov 1882 (age 13), buried 19 Nov 1882 in Mercer Cemetery.28 Joshua died less than one month after his older brother Jeremiah. No cause of death was listed, however he’d accidentally shot himself in the hand in June. Mary and William had one known child together: Joseph Lester Raper (19 Jul 1892 – 26 May 1899). 1. 1841 Census of England, Lancashire, Ashton Under Lyne, p. 29 Line 17; digital images, The Generatins Network, Inc., “1841 England Census,” Jeremiah Walker, 8 (born abt 1833) Ancestry (http://www.Ancestry.com). 2. St Michaels (Ashton Under Lyne, Lancashire, England), “Baptisms,” Jeremiah Walker, baptized 18 Aug 1844, son of Jeremiah and Mary Walker; FHL microfilm 1,538,434. 3. “Philadelphia Passenger Lists, 1800-1945,” online images(accessed 8 Jul 2017), manifest, Wyoming, 13 Apr 1848, Jeremiah Walker, 15, Spinner, England. 4. 1850 U.S. census, Burlington, New Jersey, population schedule, Westhampton, p. 246A, dwelling 78, family 79, Jeremiah Walker, 18, Weaver; digital images, Ancesty (accessed 8 Jul 2017); citing National Archives and Records Administration microfilm M432, roll 443. 5. Church of the Redemption (Philadelphia, Pennsylvania, Philadelphia County), “Marriage Record,” Jeremiah Walker to Mary J. Kimble; FHL microfilm 1488670, item 1. 7. “New Jersey, Deaths and Burials Index, 1798-1971,” database, Mary Jane Walker, age 42, b 1837, d 4 Nov 1879; FHL Film #589828..
9. “Walker, Mary Jane, d. 4 Nov 1879, burial 6 Nov.,” Trenton State Gazette, Thur, 6 Nov 1879, p. 2; digital images. 10. Mercer County, New Jersey, death certificate (6 Sep 1885), Jeremiah Walker; New Jersey State Archives, Trenton. 11. Church of the Redemption (Philadelphia, Pennsylvania, Philadelphia County), “Baptismal Record,” Mary Alice Walker; FHL microfilm 1,731,982, item shows birth date of 8 Nov 1858. 12. Pennsylvania City of Philadelphia, Philadelphia City Death Certificates 1803-1915, FHL microfilm 1,977,529, Mary Alice Walker, died 4 May 1861; digital image, Family Search, New Family Search (http://pilot.familysearch.org: 2 Jul 2017). 13. Church of the Redemption (Philadelphia, Pennsylvania, Philadelphia County), “Baptismal Record,” Margaret Ann Walker; FHL microfilm 1,731,982, item shows birth date of 3 Jul 1859. 14. Mercer, New Jersey, Probate, Guardianship, Vol C: 97, Mary E. and Sarah Walker, daughters of Jeremiah Walker dec’d. 15. Obituary, “Stone – 12 Aug 1887, 29 years, Greenwood Cemetery,” Trenton Evening Times, 14 Aug 1887, p. p5; digital images(accessed 8 Jul 2017). 16. Obituary, “Mrs. Margaret Stone, died 21 Nov 1943,” Trenton Evening Times, 22 Nov 1943, p. 13; digital images(accessed 8 Jul 2017). 18. “New Jersey, Marriage Records, 1670-1965,” database(accessed 8 Jul 2017), Wm H. Walker and Martha M. Green, 27 Dec 1888, Trenton, Mercer; FHL Film #495708. 19. 1900 U.S. census, Mercer, New Jersey, population schedule, Trenton, enumeration district (ED) 80, p. 1A, dwelling 14, family 14, William Walker, 37, Martha 28, Howard 4; digital images, Ancestry; citing National Archives and Records Administration microfilm T623, roll 982. 20. 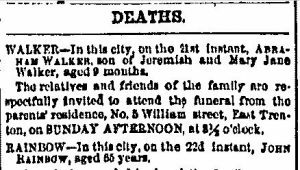 Death Notice, “William H. Walker died Saturday,” Trenton Evening Times, 18 Jun 1906, Monday, p. 1; digital images. 21. Death Notice, “Mrs. Dock Succumbs,” Trenton Evening Times, Tuesday, 24 Apr 1934, p. 8; digital images. 22. “New Jersey, Births and Christenings Index, 1660-1931,” database, John Rogers Walker, Birth 1863, FHL Film 542528. 23. “New Jersey, Deaths and Burials Index, 1798-1971,” database, John R. Walker, age 8 mo, died 30 Jul 1864, Laurence, Father Jeremiah Walker, Mother Mary; FHL Film 584570. 24. “Walker, John Rogers. 30 Jul 1884, funeral 1 Aug 1884,” Trenton State Gazette, Monday, 1 August 1884; digital images. 25. “New Jersey, Births and Christenings Index, 1660-1931,” database, Jeremiah Walker, born 27 Jul 1866, Laurence Twp. 26. Mercer County, New Jersey, death certificate (29 Oct 1882), Jeremiah Walker; New Jersey State Archives, Trenton. 27. “New Jersey, Births and Christenings Index, 1660-1931,” database, Joshua Walker, 9 Sep 1869, Trenton, Jermiah Walker, Mary Jane; FHL Film #494165. 29. “New Jersey, Marriage Records, 1670-1965,” database, Wm Roper and Mary E. Walker, 25 Dec 1890, Trenton; FHL Film #495712. 30. “Mrs. William Raper, 18 Jan 1906, Greenwood Cemetery 20 Jan,” Trenton Evening Times, Friday, 19 Jan 1906, p. 2; digital images. 31. “New Jersey, Births and Christenings Index, 1660-1931,” database, Sarah Walker, 29 Jul 1872, Trenton, Jerry & Mary J. Walker; FHL Film #494173. 32. “New Jersey, Marriage Records, 1670-1965,” database, William F. Brown and Sarah Walker, 21 Nov 1894, Trenton; FHL Film #495720. 33. “Mrs. 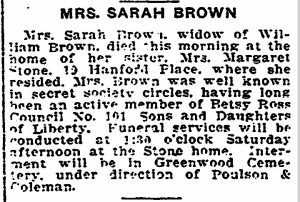 Sarah Brown, died 2 Jan 1918, burial 5 Jan,” Trenton Evening Times, Wed, 2 Jan 1918, p. 2; digital images. 34. “New Jersey, Births and Christenings Index, 1660-1931,” database, Abraham Walker, 4 Apr 1874, Father Jeremiah Walker, Mother Mary J. 35. “Deaths – Walker, Abraham d. 21 Jan 1875, burial 24 Jan,” Trenton State Gazette, 23 Jan 1875, Sat., p2; digital images.